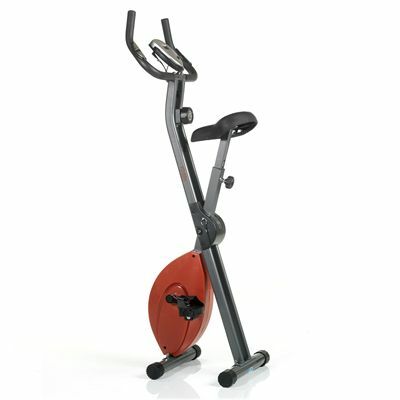 The DKN folding XD exercise bike comes with a 5kg (11lbs) flywheel to ensure smooth operation and features 8 levels of manual magnetic resistance providing versatile workouts. It is fitted with an LCD display offering feedback on key workout data such as distance, time, speed, calories and heart rate. The bike utilises a compact foldable design and weighs 15kg (33lbs). This sleek machine enables you to measure the heart rate thanks to the grip handlebar sensors. In addition, it has a maximum user weight of 100kg (220.5lbs) and comes with a 2 year warranty. As good as I was led to expect. So far reasonably good. Relatively easy to assemble. But the saddle does not go very high. I am 5ft 7in and at its maximum saddle height my leg is not quite straight when the pedal is at its lowest point. I would have preferred it to be straight. Anyone taller might not find it appropriate. It's a great bike with a great price and so easy to move and fold . I used to pay almost £50 P/M for gym which I only used to go for cycling, I saved too much money and now I can play my favourite music and stay at home and save money ;) Fast and great service . I am so happy with it . I 100% recommend it . We've got this bike for the family use and we are really happy with it. 4 people use it everyday for more than 3 hours in total and everything is fine with the machine (it is quite surprising, as my children managed to break the previous bike in less than a month!) Very comfortable seat and a surprisingly solid construction. It is also very easy to assemble and offers nice workout possibilities. For sure, the XD bike offers a good value for money and thanks to its folding feature it is perfect for home use. At the beginning I wasn't sure about this bike; folding system and small size made me feel a bit uncomfortable. Finally I decided on this model due to its price and a nice monitor, which was really good-looking as for the bike in this price range. The seat could be a bit more comfortable but the whole construction seems to be durable and solid. Definitely this bike is perfect for people who have just started their fitness adventure as it is really easy to use and maintain. I know, it may sound absurd, but I've decided on this bike because of its colour! I wasn't sure what I can expect from folding exercise bike, but it is definitely a great piece of equipment. Very comfortable seat and a solid construction. I especially like size of this bike as I can keep it wherever I want. It is also very handy and easy-to-use. Good value for money and a great construction idea. Very good bike at a reasonable price. I couldn't expect anything better than this for £100! Also the folding system and a low product weight are big advantages of this machine. The lack of pre-set workouts is a bit annoying, but I tried to control the workouts myself and increase the resistance every 10 minutes. The construction is definitely solid and the installation process extremely easy. Nice machine at a nice price. This bike definitely is a good value for money. Solid, durable construction, nice and clear console, very comfortable seat. What I would add to this machine is resistance as 8 levels are simply not enough for advanced training, but for this price I can’t expect anything more. Overall, I'm very satisfied with this machine and all its features. I’m not a fitness specialist, so I just bought this bike as I felt to do so. Good price, solid construction and a foldable design made it very attractive for me. I use it every day and control all my workout data on the little screen – it is very helpful when you know more about what you've just done :) Very comfortable seat and a stylish design. The XD bike is perfect for all small flats – when folded we keep it in the wardrobe! It features lots of programmes and resistance levels as for bike at this price. We weren't sure about this machine as we thought it is too cheap for all its features, but we have to admit that this bike met all our requirements. It looks a bit unstable, but actually, the frame is solid and the seat comfortable. We use it very often and so far no technical problems at all. for submitting product review about DKN Folding XD Exercise Bike.